Smashburger Buffalo & Blue Cheese is a bit unusual, as it is a hamburger, but it is prepared “buffalo” style. You so often find chicken sandwiches done in a buffalo style, but at Smashburger you can get this burger done in a buffalo style. Smashburger makes some of the best burgers you will ever find in a restaurant. They use high-quality ingredients and they make everything to order. When burgers are handcrafted burgers seared and seasoned to order, using fresh, never frozen Beef, it’s hard to go wrong. I recommend using ground chuck for this recipe. It has the right amount of fat to lean ratio to make a flavorful burger. The supporting cast for this burger include an egg roll, so it isn’t your average burger bun. 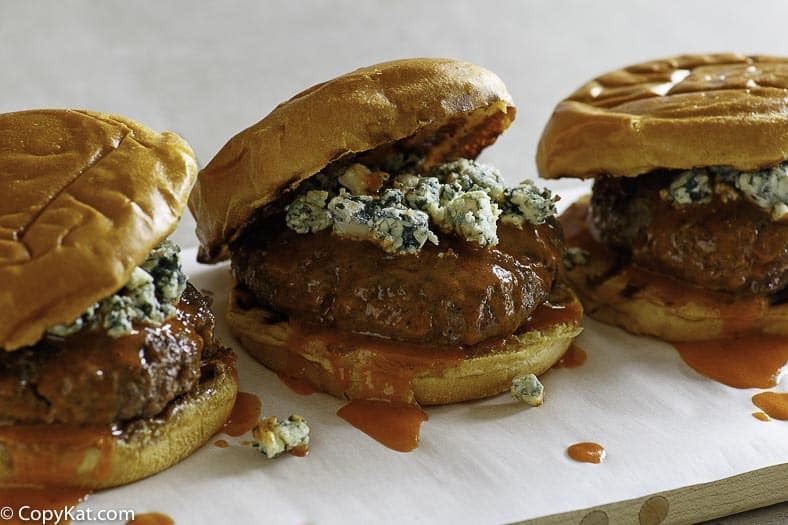 The Smashburger Buffalo & Blue Cheese is dressed very simply, you will make a homemade buffalo style sauce, and you will need crumbled blue cheese. I personally like Maytag blue cheese, if available, you may want to purchase this, if not, use what your grocery store sells. If desired you can add tomatoes and fresh lettuce to this recipe. Let’s address the cooking technique on this burger. The meat patties are first formed into a ball, then the burger is literally smashed onto the hot grill when it is cooked. When you physically smash the burger onto the grill you will help force the meat to brown and get crispy on the surface. You will also liberally season the burger with a homemade seasoning. It’s important to season the burger while cooking so the best flavors are brought out. 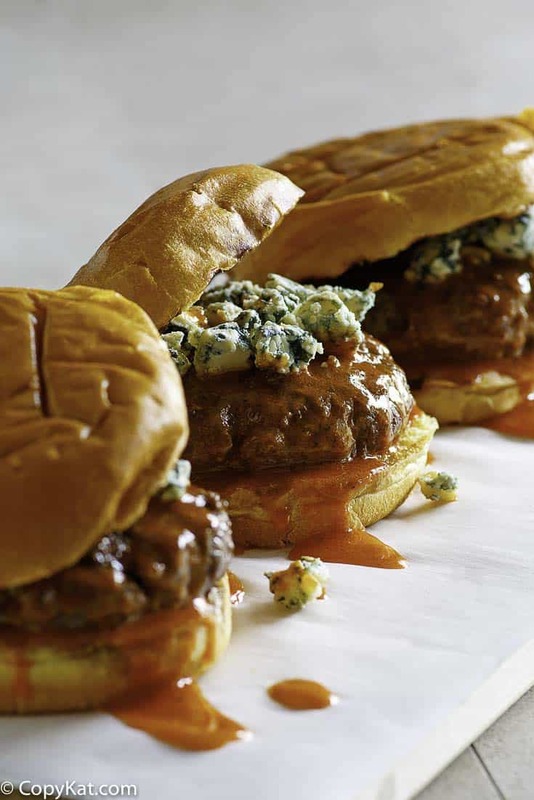 The buffalo sauce is the sauce of choice for this burger. You will make a buffalo sauce. I do have a brand recommendation for this burger, my recommendation is Frank’s Red Hot Sauce. Frank’s Red Hot Sauce has a great flavor, it isn’t too hot, and it has a well-rounded flavor. Unlike Tobasco, it gives flavor in addition to heat. Smashburger uses a griddle to cook their burgers. If you don’t have a griddle at home, I recommend a good old-fashioned cast-iron skillet. They do a wonderful job of browning meat. One of the characteristics that make Smashburger so good is the browning of the ground beef. For everyone that loves buffalo style food is going to love this burger! You love buffalo chicken sandwiches, but this is the same sauce in a burger. Prepare hot sauce by combining all ingredients in a saucepan over medium-low heat. Stir until butter is melted, and all is well blended. Set aside. Prepare burger seasoning by combining kosher salt, ground black pepper, and seasoned salt in a small bowl. Divide ground chuck into 4 different portions. Roll meat into a ball. Heat grill to a medium-high heat. Place meat portions on the grill. Press meat into the grill, and then liberally season with burger seasoning. Flip meat patty once the bottom has browned, season the top of the burger. Brush buns with butter, and toast on the grill. 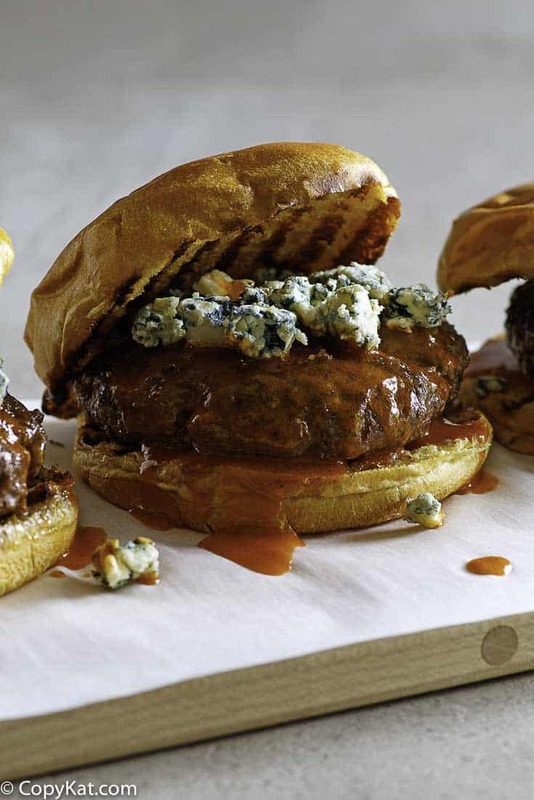 To assemble burger place down the bottom bun, the burger, add about 1 to 2 teaspoons of hot sauce to the burger, and then top burger with blue cheese crumbles. Add shredded lettuce and tomatoes if desired. Im so hungry when come here. I need a big burger right now. I must go to the supermarket right away. Hi… I am looking for a copycat recipe for a place in Ojai California… By the name of… The deer lodge… They serve an incredible roasted brussels sprouts… Any ideas? Do you have the recipe for the Chipotle hamburger buns. Did you mean Chipotle Mexican Grill or another restaurant named Chipotle, or perhaps hamburger buns with Chipotle peppers? We were actually going to order in for my birthday tomorrow however after seeing this I am cooking by choice now. Looks delicious! Just love this burger!! Made them tonight for my Friday night poker group, I just know they are going to love them. Did them on the grill and are keeping warm in the oven. Agree with you on Tobasco Sauce. Heat with no flavor. Frank’s, Cholula and Crystal are all in our home. If I wanted a full-house I would add Sriracha and Texas Pete. You sure do offer some great recipes! I hope you enjoy this recipe. I loved how Smashburger used beef instead of chicken for this one. I bet they will be great on the grill! Good luck tonight!